In the classic guyaberra style, the 4 pocket front has 2 standard breast pockets and 2 pleated bottom pockets. Continuing in the classic guyaberra style, a pleated back panel is set between the yoke and waistline band. Beneath the belt the panel is pleated with side slits to assure comfortable freedom of movement. All this is designed to be un-tucked. Totally cotton - 100% cotton rules on the majority of our clerical shirts. Seeking out the finest quality for the color and character requested, these clerical shirts wear with the least care required. Cotton-rich Oxford cloth - with 70% cotton and 35% polyester, this Oxford cloth is cool to wear but permanent press to care. Southern linen - with 55% linen and 45% cotton, this fabric is cool, durable and just gets better the more it is worn. Versatility is a key to success in living a life of service. 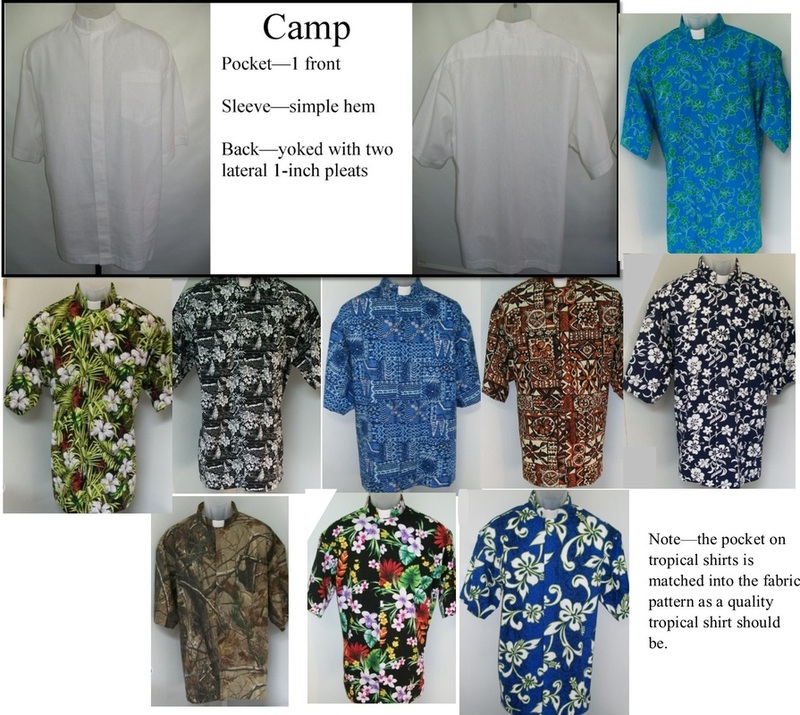 The Camp clerical shirt goes from clergy to casual in 10 second or less. Remove the linen tab, unbutton the top button – Voila – casual comfort rules. The Roman collar is 1½” high with 2” opening holding the custom-designed cloth white tab. The front placket conceals the button closures.